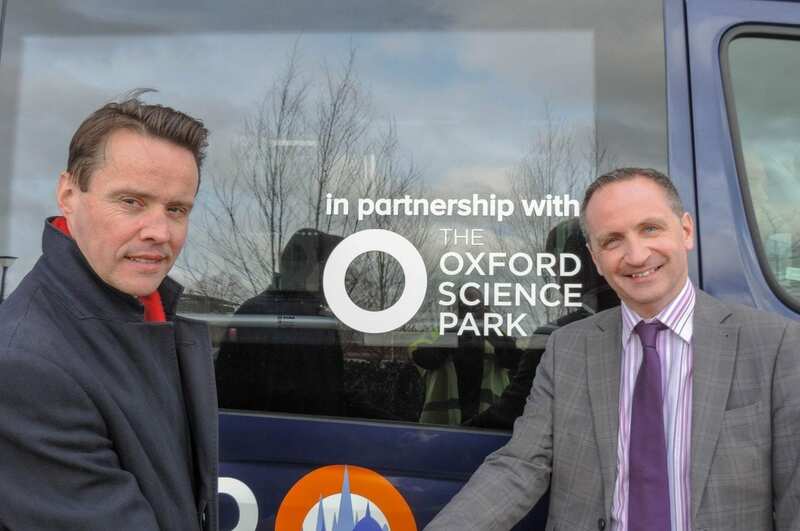 Oxford Bus Company and The Oxford Science Park have formed a partnership to strengthen the PickMeUp on-demand minibus service in the Eastern Arc of the city. The Oxford Science Park has become a formal corporate partner of the innovative ride sharing service, providing annual investment to support the pilot scheme. PickMeUp, which launched last June, was the first public transport provision of its kind in the UK. The service enables people to request a bus pick-up at a virtual bus stop using a mobile phone app. It offers flexibility for passengers who can choose both the starting and finishing point of any journey within the zone around the Eastern Arc of Oxford, which includes the University Science Area, the John Radcliffe Hospital and the railway station. Oxford Bus Company introduced the service as a pilot scheme following the backing of parent company the Go-Ahead Group and in response to feedback from residents that greater connectivity was required in the Eastern Arc of the city. When the service launched, Oxford Bus Company appealed for support from the business community and offered various corporate packages. The Oxford Science Park is the first corporate partner and the partnership will help PickMeUp continue to provide improved connectivity for The Oxford Science Park’s occupiers and visitors.